Noticed at the store the other day that some of the new pets are made of the most incredibly soft materials – almost as good as my chinchilla, Gizzy. Are any of your friends especially soft? The tactile response is amazing. On the same topic, I’m now getting a few more seconds each time of Gizzy letting me pet her, an experience that leaves very good tactile memories. She is SO soft, but SO skittish. And only stays while I’m feeding her rolled oats, one flake at a time. Your friends don’t run away. 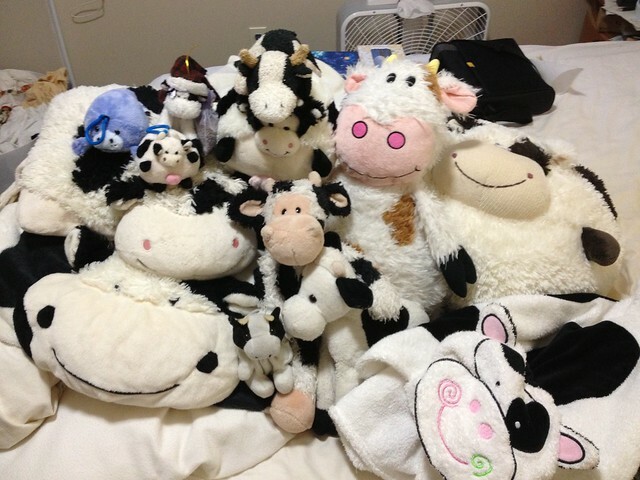 Ike, Cozy Cow, and the Overcow are pretty soft. Large Round Cow is pretty excellent too.